This web site presents a list of free and open source Scrum tools and solutions for Agile project management: sprints, releases, velocity, backlog, user stories management, retrospectives, product owners, scummaster. Scrum is an iterative and incremental project management framework for Agile software development. Scrum tools allow the product owner to manage the requirements with a product backlog of epics, features and user stories. The ScrumMaster uses Scrum tools to track the Scrum sprints with Scrum burndown charts and velocity. He might also plan the work with planning poker. After each Scrum sprint, the team reflect about its work with retrospectives. Modern tools allows to adopt Agile scaling approaches like SAFe, Lesss or Nexus. You will also find on this web site Kanban free and open source tools that can be used for a Lean approach to software development projects. Kanban is a Lean project management approach that encourages a pull approach to project management and the limitation of the work in progress (WIP) to avoid waste. 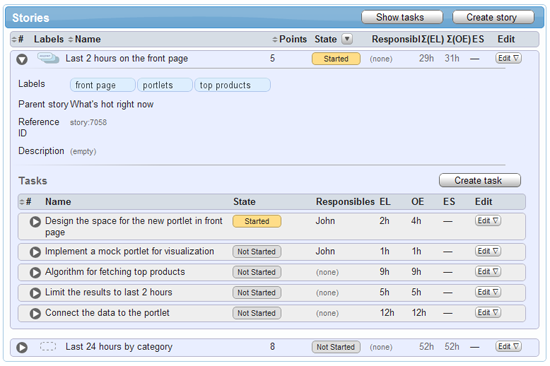 Open source Kanban tools allow visual project management with information radiators where you can visually manage the workflow of tasks represented on the lanes of a visual board. Agilo for trac is an Agile and Scrum Tool that delivers a robust platform and streamlined functionality for agile teams using trac and agile methodologies. There is an open source, a commercial and a hosted version of the tool. Each download of Agilo for trac comes with a free 30-day evaluation of all the enhanced features of Agilo for trac Pro. After the 30 days these enhanced features are deactivated automatically. From that moment on you can purchase Agilo Pro Licenses or continue to use the free version. agileMantis tries to bridge the gap between the open source bug tracking system MantisBT and Agile software development with Scrum. You can manage requirements for software products with MantisBT when these requirements are represented by issues that can be picked up and processed for defined target versions of the software. 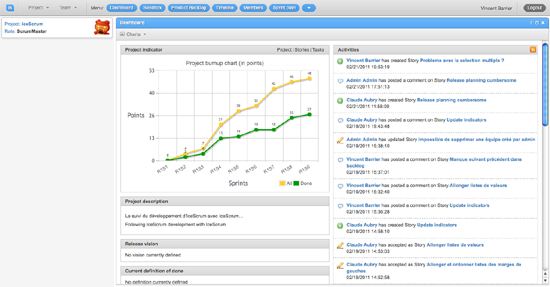 ezScrum is an open source process management tool for the Scrum Agile project management approach. Kanbanik is a free and open source kanban board which can be used for personal kanban as well as for managing of small teams. Multikanban is a simple open source kanban board for multiple personal projects. OrangeScrum is an open source Agile project portfolio management tool that has also a commercial online hosted option with a free plan for small team. Plandora is a multi-project management, web-based Project Management suite with Agile features. Scrum-Zamurai is an agile Scrum management web application which sticks to the ways of "Agile Samurai"
Scrumforce is a Force.com app on the AppExchange that provides the ability to manage SCRUM agile projects. Scrumforme is an open source project management tool meant to be easy, organized and accessible. Inspired by Agile methodology using Scrum and Kanban simplifying teamwork. 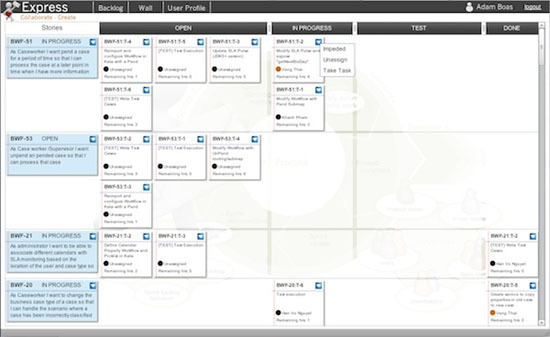 Scrum-it is a open source digital Scrum Board based on multi-touch and modern web technologies. It supports your Scrum Team with a board which can manage projects, team members, sprints, userstories, tasks and the burn down chart. Scrumpy is a free real-time, web-based Scrum tool, designed to skyrocket your Scrum team's productivity. Scrumpy servers as an all-in-one solution, as well as an auxiliary tool which supports even teams who only want to visualise their work via a task board. Scrum Vision is a set of tools that connect Eclipse Mylyn to Google Spreadsheets. Google spreadsheet templates are available to manage a full Product Backlog or just and Iteration Backlog. Scrumwala is an open source Scrum / Agile project management web app for personal use built with Laravel. Taiga is a free Agile open source project management tool that has also a hosted commercial version. Taiga support both Scrum and Kanban approaches. The product backlog is what will ultimately be delivered, ordered into the sequence in which it should be delivered. Product Backlogs are broken into manageable, executable chunks named sprints. Every certain amount of time the team initiates a new sprint and commits to deliver a certain number of user stories from the backlog, in accordance with their skills, abilities and resources. The project advances as the backlog becomes depleted. Small tool for printing task cards used for a Scrum board. Your physical Scrum board will look fantastic. Supports Team Foundation Server and Visual Studio Team Services. TaskJuggler is a modern and powerful, Open Source project management tool. Its new approach to project planing and tracking is more flexible and superior to the commonly used Gantt chart editing tools. It has already been successfully used in many projects and scales easily to projects with hundreds of resources and thousands of tasks. TaskJuggler provides an optimizing scheduler that computes your project time lines and resource assignments based on the project outline and the constraints that you have provided. The built-in resource balancer and consistency checker offload you from having to worry about irrelevant details and ring the alarm if the project gets out of hand. The flexible as-many-details-as-necessary approach allows you to plan your project as you go, making it also ideal for new management strategies such as Extreme Programming and Scrum Agile Project Management.